You can use the Oracle VM Server for SPARC software to assign an entire PCIe bus (also known as a root complex) to a domain. An entire PCIe bus consists of the PCIe bus itself, and all of its PCI switches and devices. PCIe buses that are present on a server are identified with names such as pci@400 (pci_0). An I/O domain that is configured with an entire PCIe bus is also known as a root domain. 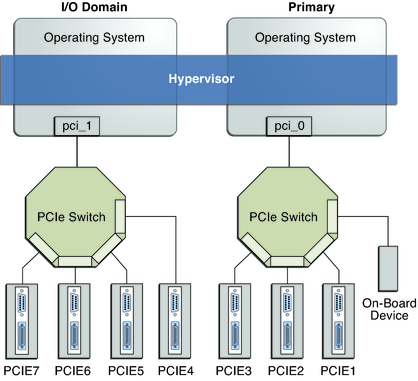 The following diagram shows a system that has two PCIe buses (pci_0 and pci_1). Each bus is assigned to a different domain. Thus, the system is configured with two I/O domains. The maximum number of I/O domains that you can create with PCIe buses depends on the number of PCIe buses that are available on the server. For example, if you are using an Oracle Sun SPARC Enterprise T5440 server, you can have up to four I/O domains. Note - Some UltraSPARC servers have only one PCIe bus. In such cases, you can create an I/O domain by assigning a PCIe endpoint (or direct I/O-assignable) device to a domain. See Assigning PCIe Endpoint Devices. If the system has a Network Interface Unit (NIU), you can also assign an NIU to a domain to create an I/O domain. When you assign a PCIe bus to an I/O domain, all devices on that bus are owned by that I/O domain. You are not permitted to assign any of the PCIe endpoint devices on that bus to other domains. Only the PCIe endpoint devices on the PCIe buses that are assigned to the primary domain can be assigned to other domains. When a server is initially configured in a Logical Domains environment or is using the factory-default configuration, the primary domain has access to all the physical device resources. This means that the primary domain is the only I/O domain configured on the system and that it owns all the PCIe buses. This example procedure shows how to create a new I/O domain from an initial configuration where several buses are owned by the primary domain. By default the primary domain owns all buses present on the system. This example is for a SPARC T4-2 server. This procedure can also be used on other servers. The instructions for different servers might vary slightly from these, but you can obtain the basic principles from this example. First, you must retain the bus that has the primary domain's boot disk. Then, remove another bus from the primary domain and assign it to another domain. Caution - All internal disks on the supported servers might be connected to a single PCIe bus. If a domain is booted from an internal disk, do not remove that bus from the domain. Also, ensure that you are not removing a bus with devices (such as network ports) that are used by a domain. If you remove the wrong bus, a domain might not be able to access the required devices and could become unusable. To remove a bus that has devices that are used by a domain, reconfigure that domain to use devices from other buses. For example, you might have to reconfigure the domain to use a different on-board network port or a PCIe card from a different PCIe slot. In this example, the primary domain only uses a ZFS pool (rpool (c0t1d0s0)) and network interface (igb0). If the primary domain uses more devices, repeat Steps 2-4 for each device to ensure that none are located on the bus that will be removed. Determine the PCIe bus under which the boot disk is connected. Determine on which PCIe bus the initiator port is present. Identify the primary network interface that is “plumbed” by using the ifconfig command. If the network interface used by the primary domain was on a bus that you want to assign to another domain, the primary domain would need to be reconfigured to use a different network interface. In this example, bus pci_1 is being removed from the primary domain. You must also initiate a delayed reconfiguration. Reboot the root domain so that the change takes effect. Stop the domain to which you want to add the PCIe bus. Add the available bus to the domain that needs direct access. The available bus is pci_1 and the domain is ldg1. Restart the domain so that the change takes affect. This output confirms that PCIe bus pci_0 and its devices are assigned to the primary domain. It also confirms that PCIe bus pci_1 and its devices are assigned to the ldg1 domain.